The importance of keeping kids active year-round. A summertime baby can be a treat; with your first few months together spent enjoying the nice weather, relaxing at home and not having to stress over an impending holiday or work-related function. But what about the big brother or sister who is home from school and looking for something to do besides playing with the new baby? Keep older children from falling into a rut with interactive videos you both can enjoy while bonding with baby at home. Those A-plus school year habits, including healthy dinners and daily exercise, can easily fall out of a summertime schedule with the arrival of a new baby. While your child may happily abandon their routine during for the first few weeks of vacation, less structured days can lead to boredom and inactivity, with the Center for Disease Control and Prevent reporting that 62 percent of elementary and middle school aged children do not engage in any physical activity during non-school hours. With the development of educational fitness videos, like Adventure to Fitness, keeping your child active year-round is easy and entertaining. By encouraging them to engage in physical activity, you can help improve their self-esteem, social skills and healthy habits while reducing their risk for obesity and preventing them from making poor eating choices. If you know your child will be cooped up with you and your baby, map out a schedule of interactive programming for the week that will get them moving while learning about nutrition and health. Used in over 75,000 classrooms nationwide by elementary school teachers, Adventure to Fitness combines education with physical activity in a way that's stimulating and exciting for your child. Stream videos right to your home and watch Mr. Marc, the onscreen guide, provide fitness routines, games, activities and recipes that your child will love. Involve yourself in the fun during baby's naptime by trying an exercise routine together. "Adventure to Fitness is able to influence the fight for greater heart health because it has staying power," said Jenny Delfin, MD and cardiologist at the NYU Langone Medical Center. "These 30 minute episodes are not only offering a fun way to learn about nutrition while moving and getting cardiovascular, aerobic exercise, they're making a permanent impact on the lives of children they touch. Signing up for the program will also allow you to follow your kids health and fitness progress during the school year (if they have the program in the classroom) and give you access to free healthy recipe ideas, games and activities. 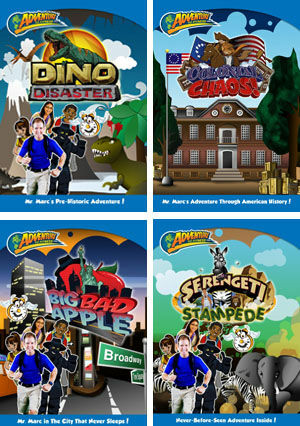 Learn more about purchasing Adventure to Fitness DVDs or streaming videos at home by visiting adventuretofitness.com.